Our races are run under Scottish Cycling's Technical Regulations - you can find the latest available regulations here. Competitors should familiarise themselves with the rules before racing. 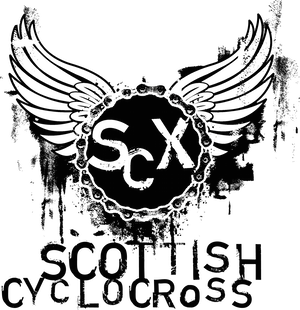 The Scottish Cyclocross season consists of six series events and a Scottish Championships event plus other non-series events. A season long league runs in open and age related categories with some some top-notch prizes on offer. The final standings are based on your best five results over the six races in the series. If you ride fewer than five races then they will all count - there is no minimum number of rounds and no mandatory rounds. The scoring scheme can be found here. Scottish Cycling Championship races are subject to Scottish Cycling's eligibility rules - please check here for details. All bikes are allowed at SCX races (as long as they're safe for you and others) - cyclocross, mountain bikes, BMXs, even your Mum's old shopping bike. Courses favour those on cyclocross bikes – choose your weapon wisely! Each race in the series is officiated by a suitably qualified British Cycling commissaire. The commissaire are there to ensure that races are safe and fair. Please listen to any instructions that the commissaire might give you on race day. Commissaires will be happy to answer any questions you have about the event, please don't hesitate to speak to them at any time (but remember that it can get a bit hectic right at the start of a race). Can you advise if there are any restrictions re disc brakes and flat bars? I presume bar ends are not allowed but can I run flat bars? There are no restrictions on bikes used in Scottish CX races, except that any non-standard wheels must meet UCI regulations (see here for more information - http://lyxus.net/bjby). So flat bars, barends and disc brakes all allowed. Please make sure you have bar end plugs fitted as unplugged bars pose a risk of injury to youselves and others if there is a crash. It is your age on the first of September that counts for the age categories. I'm just curious where this rule came from. I'm a qualified cycling coach and therefore feel its important to understand the rulebook - so can anyone explain this to me. for racing purposes must be removed. cycle is in a safe condition. Ahh - that explains the decision. It basically came down to a safety call. I hadn't looked in the generic rules but had only looked at the CX specific rules. Okay - that clears that one up for me. Thank you very much for responding. The commissaire is boss on the day, so if you have any doubts or queries about equipment or anything else then please feel free to ask them directly. Can somebody help me out. I am a grubby mountain biker, and have just bought a cross bike with the plan to do some races. I am not part of a club, nor hold a BC membership. Can I race? What is the minimum requirement? Also, what is the craic with clothing? If I'm not part of a club, do I need to wear unbranded gear, or can I use my existing branded multi-coloured mtb stuff? SCX races are grassroots events, so no minimum requirements as such. Your bike has to be safe for you and others, which means bar ends have to be fitted and things like racks should be removed. Kit wise - there are some BC rules, but MTB kit will be just fine. The winner of last years series raced in baggies, so it's not wall-to-wall skinsuits. You can buy a day licence if you're not a BC race member to cover insurance.